More than 200 civilians have been killed in Russian airstrikes in Syria, an Amnesty International report says, quoting witnesses and activists. Amnesty International accused Russia of using cluster munitions and unguided bombs on civilian areas, and said such attacks could constitute war crimes. Moscow insists it is targeting only the positions of “terrorist” groups. 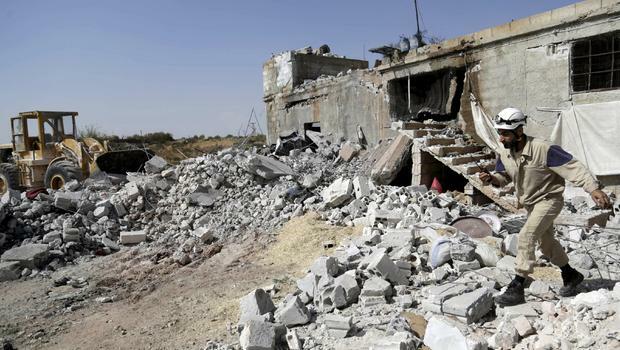 The human rights said in its report it is also researching concerns about the US-led coalition air strikes in Syria. The US has rarely acknowledged civilian deaths in its aerial bombardment of ISIS, which began in September 2014. Russia began air strikes in September this year, saying it was acting at the request of Syrian President Bashar al-Assad. It is targeting ISIS and other groups it has designated to be terrorists, some of which are backed by the West. In the report, Amnesty said it had “researched remotely” more than 25 Russian attacks that took place in Homs, Hama, Idlib, Latakia and Aleppo between September 30 and November 29. It had interviewed “by phone or over the internet” witnesses to the attacks, and had audio and video evidence, as well as “advice from weapons experts”, Amnesty said. It said there was evidence that Russia’s military “unlawfully used unguided bombs in densely populated areas and inherently indiscriminate cluster munitions”. Amnesty set out its findings into six attacks – each of which, it said, caused dozens of civilian casualties, but had no obvious military target nearby. On November 29, for example, it said at least one suspected Russian warplane fired three missiles into a busy public market in Ariha, in Idlib province. A local activist group said a total of 49 civilians were either killed or missing and feared dead. “It was a normal Sunday; there was nothing unusual. People were buying goods; children were eating,” the activist, Mohammed Qurabi al-Ghazal, told Amnesty. Mohammed Qurabi al-Ghazal said the armed group Jaysh al-Fateh controlled the area, but did not have any presence inside Ariha itself. “Some Russian air strikes appear to have directly attacked civilians or civilian objects by striking residential areas with no evident military target and even medical facilities, resulting in deaths and injuries to civilians,” Amnesty’s Philip Luther said. However, Russia’s presidential spokesman Dmitry Peskov, when asked on Monday if Russia was using cluster bombs, said Moscow was “conducting its operation in strict conformity with principles and norms of the international law”. The Kremlin has previously described similar reports as attempts to discredit its operations in Syria, describing such claims as part of “information warfare”. More than 250,000 people are believed to have been killed and millions of people have been forced to flee their homes since the conflict began in Syria in March 2011.